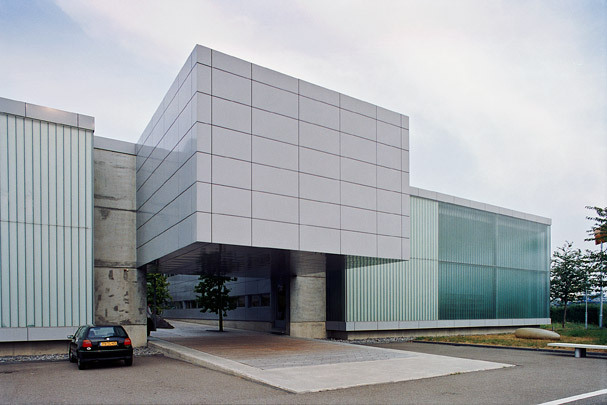 This rectangular commercial building is entirely clad in storey-high, translucent U-shaped profiled glass, including the pivoted door of the emergency exit. Inside this glass skin, the building proper consists of two parts separated by a full-width aluminium-walled light court. On axis with this space are two aluminium-clad boxes projecting from the envelope and containing the entrance and a first-floor meeting room respectively. To the left of the light court are the showrooms, with the reception, canteen and a large storage space to the right. Upstairs, offices line both sides of the court.